Things with mass naturally pull other things with mass toward them in a straight line. As you get closer, the pulling gets stronger. For example, you feel lighter on the top of Everest than at the base (100 lbs feels like 99.7 lbs). Now let's talk about orbits. Imagine a bowling ball far above the Earth's surface. The ball is high enough it would take 5 minutes to free fall to the surface. To get into orbit, you just need to ball to move "sideways" fast enough in 5 minutes that it "misses" the Earth. In the sketch below, you can see some paths that crash into the Earth, and the orbit that ensues when you go fast enough to miss it. To calculate our orbits, we pick an object (body), and compute its force of gravity coming from all the other bodies in the simulation. From the force, we can find the current acceleration thanks to Newton's second law (F=ma). where aix is acceleration in the x direction for body i, G is the gravitational constant, m is the mass of a body, and x,y,z are the coordinates of a body. The body we are calculating for is index i, and we sum contributions from all other indices j. The y and z directional accelerations are computed just by changing the final term (x_j - x_i ) to your desired dimension. As we already know the velocity and position of the object, knowing the acceleration allows us to calculate the bodies location a small time in the future. The acceleration is always changing though, so the smaller the time step, the more accurate our simulation. Then we repeat this for all the other bodies, and update the positions simultaneously. This is called the Euler Method (err... actually, the Euler-Cromer method based on comments below). If you like to skip ahead, the complete code can be found here. We start by importing the necessary modules, and creating a point class, and a body class. The point class just holds x,y,z information, and the body class holds mass, location, and velocity data. These will be used throughout the program. The calculate_single_body_acceleration function takes a list of bodies, and the index of the target_body. Then we iterate through all the external bodies adding up the acceleration of our target body. With the acceleration known, the next step is to calculate the updated velocity. This is done for all bodies before changing the positions, as we want to keep the time steps synchronized. The new velocity is calculated simply by multiplying the acceleration with the time step and adding it to the current velocity. With all velocities up to date, we can now update the location for all bodies by calculating the distance traveled in the time step (velocity x time), and adding it to the current position. While we're running the simulation, the real valuable information we're finding is the x,y,z locations of our bodies. So to run the simulation, we simply repeat the calculations outlined above for a desired number of steps, and save a history of locations. This only requires a list of input bodies(with some optional parameters), and returns a list of location histories. This plots a 3d line graph with equal axis scales, sized to the largest dimension. If you provide a filename, it will save to file, otherwise you'll get a graphic popup while running. 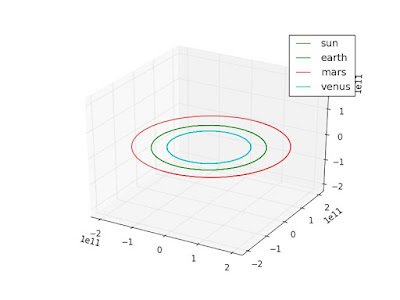 Output from running the simulation, detailing the motion of The Sun, Venus, Earth, and Mars. Now all the pieces are in place, and we just have to build up some data and run the functions we wrote in previous sections. You can tweak this however you want, but see below for an example of usage. Once you get it running, have some fun with the bodies to see what sort of wacky and unstable orbits you can create! For more fun with orbit simulations, checkout my follow up post introducing the RK4 method. Orbit calculations are inherently unstable, while multi-body interactions are dynamically chaotic. Its a great numerical exercise. Is it possible we are missing the function compute_gravity_step(). The example above doesn't include it it seems. I'm getting an error saying: global name 'compute_gravity_step' is not defined. TD, you're absolutely right. Compute_gravity_step was included in the full code link, but missing from the walkthrough. This has now been added. Thank you for the note. 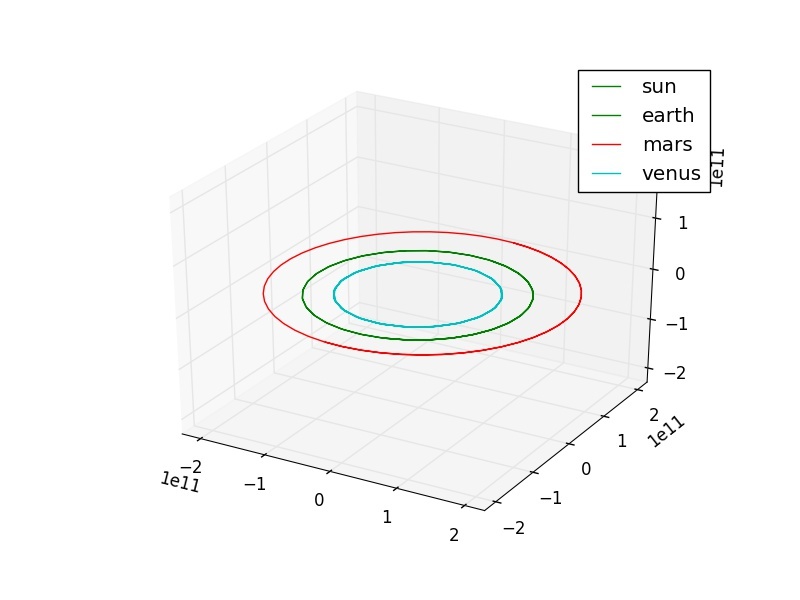 can you do a script that run the simulation of the conjunction orbit of earth-mars with python ? Yes, it is just a matter of using the right initial conditions. The walkthrough says "import matplotlib.pyplot as py" instead of "as plot"
In actual fact you have inadvertently implemented the (first-order) Euler-Cromer method, which is a symplectic (but not time-symmetric) first-order integrator. Although less accurate this will have better long-term energy stability than even RK4. I will try to remember to post a one-line adjustment to implement the second-order Stormer-Verlet (leapfrog) method instead when I get home from work. Thanks Anonymous! I realized my acceleration and locations had staggered states, so is this what makes it Euler-Cromer? I welcome any and all inputs to both the code, and correct language usage. Yes, Euler would require you to store and use the previous velocity/position, so it is actually harder than the symplectic one! You should be able to do an alternative one with the location update as the "filling" too. Did anyone have the problem where they ran this simulation and their output was only the lines on a single plane? As far as I can tell I've copied the program over verbatim and I haven't been able to find any mistakes. Instead of the rings, it appears my output is only on a single plane, so ultimately I had figured my issue was with the way the plot was written, however I can't seem to find anything in the matplot literature that would indicate an error. I apparently dont have access to the full program to differentiate from the version shown here. I'm still a very novice programmer and I'm trying to learn, so any insight would be hugely helpful. Your current account (xxxxx@gmail.com) does not have access to view this page. I found the link to the git repo, thanks. And thanks for an interesting post. Thanks Jim! Fixed. Dead links are very frustrating so I appreciate the comment, and I'm glad you enjoyed the post. > I'm glad you enjoyed the post. I did, thank you for putting it up. Although, FWIW, for me, I don't get a picture like the simulation one you have above. I get a picture of the planets and the sun lined up, but no motion.